Since I have changed companies, I have been incredibly busy as of late and my blog has had the appearance of neglect. At a minimum I was trying to do a post or two per week. The tempo will be changing soon to move closer to this…. As a first taste of what will be coming in a couple of weeks I thought I would talk a bit about something I have been thinking a great deal about. Is it possible to defy Data Gravity? Data Gravity is a theory around which data has mass. As data (mass) accumulates, it begins to have gravity. This Data Gravity pulls services and applications closer to the data. This attraction (gravitational force) is caused by the need for services and applications to have higher bandwidth and/or lower latency access to the data. After considering how this might be possible, I believe that the following strategies/approaches could make it feasible to come close to Defying Data Gravity. All of the bullets below could be leveraged to assist in defying Data Gravity, however they all have both pros and cons. The strengths of some of the patterns and technologies can be weaknesses of others, which is why they are often combined in highly available and scalable solutions. So to make this work, we have to fake the location and presence of the data to make our services and applications appear to have all of the data beneath them locally. While this isn’t a perfect answer, it does give the ability to move less of the data around and still give reasonable performance. Using the above patterns allows for the movement of an Application and potentially the services and data it relies on from one place to another – potentially having the effect of Defying Data Gravity. It is important to realize that the stronger the gravitational pull and the Service Energy around the data, the less effective any of these methods will be. Why is Defying Data Gravity so hard? The speed of light is the answer. You can only shuffle data around so quickly, even using the fastest networks, you are still bound by distance, bandwidth, and latency. All of these are bound by time, which brings us back to the speed of light. You can only transfer so much data across the distance of your network, so quickly (in a perfect world, the speed of light becomes the limitation). The many methods explained here are simply a pathway to portability, but without standard services, platforms, and the like even with the patterns etc. 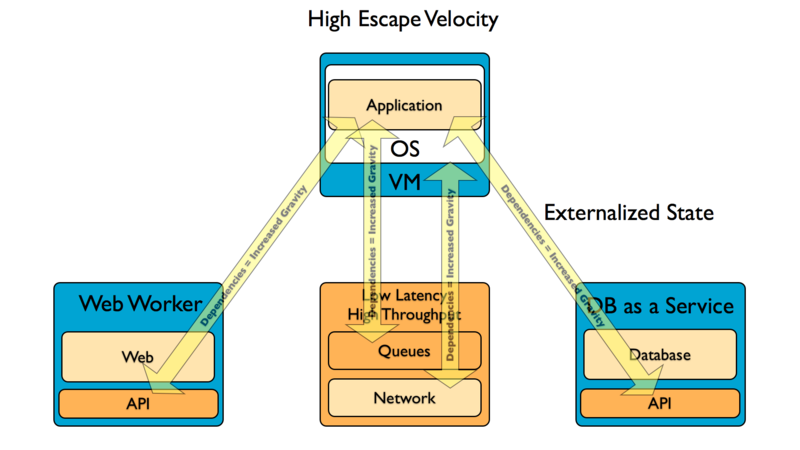 it becomes impossible to move an Application, Service, or Workload outside of the boundaries of its present location. If you want to move, be willing to accept downtime (this could be minutes to months) and simply store off all of your data and ship it somewhere else. This method would work now matter how large the data set as long as you don’t care about being down. It has been several weeks since I have posted to this blog. I would blame this on the holidays, but that would be inaccurate as it has been something far more insidious! Now the shell portion is a bit different. Since this is a CLoud Admin SHell, Cloud is an important part of idea. In this initial prototype I went through many experiments in learning the nuances of JRuby <follow on post link here>, but have been able to get a reasonable working version of VIJava (the interface I’m using to get JRuby to work with VMware vCenter/vSphere). Great, so what can I do with this prototype? -You can try it out on any of the platforms listed above! This allows a limited form of piping in clash by using the > as an operator (you must have whitespace on both sides of the > symbol. Other interfaces to the shell (for both input and output) will include a Web interface, I’m looking for thoughts on other types of interfaces desired. Where can I get the Prototype? 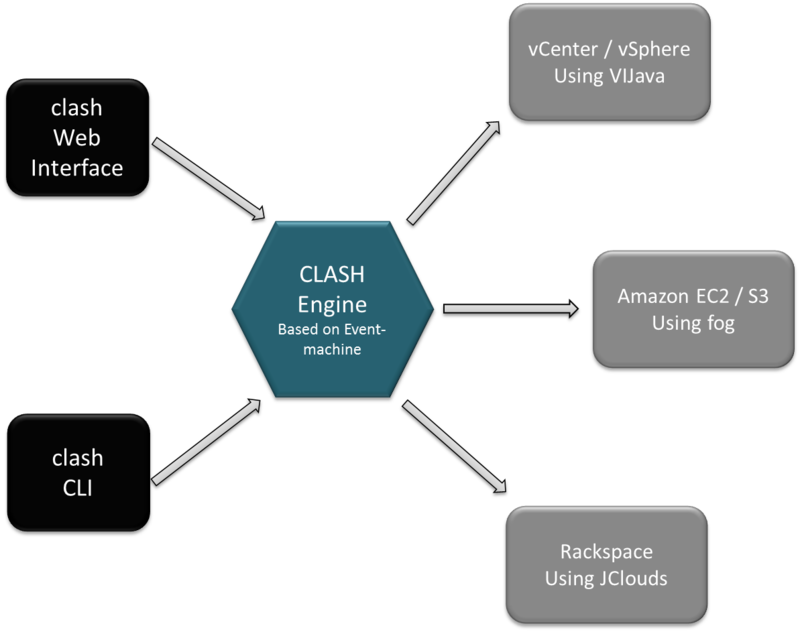 I’m looking for ideas/things that you would like to see clash do, better commands, capabilities, features, etc. The term Escape Velocity is the speed needed to “break free” from a gravitational field without further propulsion according to Wikipedia.org. 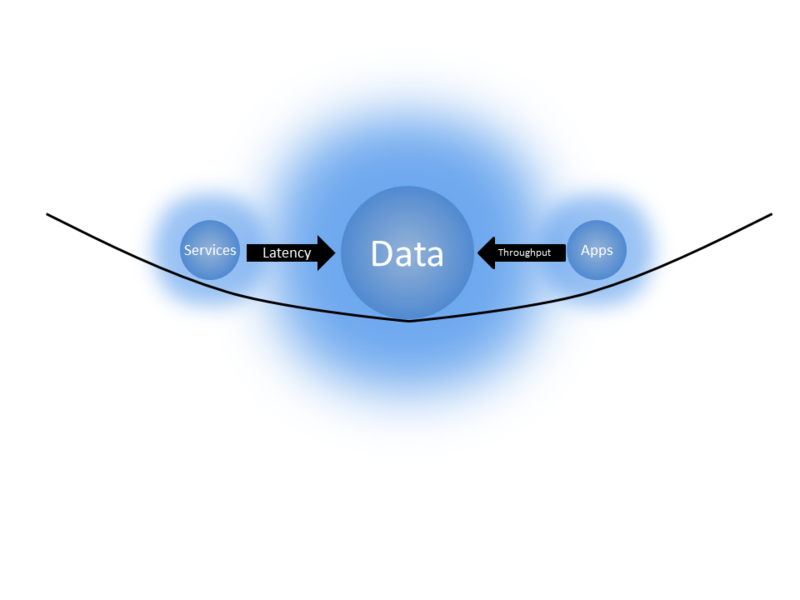 Data Gravity as explained in THIS previous post is what attracts and builds more Data, Applications, and Services on Clouds. Data Gravity also is what creates a high level of Escape Velocity to move to another Cloud. A few days ago Amazon announced a new AWS service for importing VMware disk images (VMDKs) into EC2. 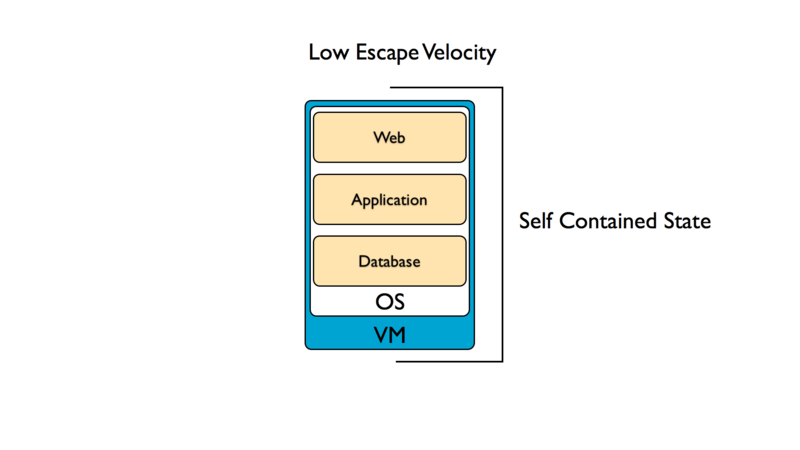 VMware already offered a method for converting EC2 instances through their Converter tool into Workstation VMs and with a 2nd pass conversion into ESX VMs. While all of this sounds wonderful and it does have value, it brings to light an entirely different issue. Only Stateful / Fully encapsulated applications can be moved around in this way. Examples of sources of Cloud Gravity (App, Service, and Data Gravity Combined) on your specific Application. If someone selects a Cloud provider and writes an application leveraging anything more than a handful of VMs, Data Gravity will make it virtually impossible to move to a new/different Cloud provider. Don’t believe it? Application code that uses the Database and Web Workers specific APIs and/or depends on Low Latency and High Throughput access to them. – The longer (more time) an Application stays in a specific Cloud the more difficult it is to move. Why? Data Gravity increases due to more Mass (data being stored). Imagine accumulating 100’s of GBs of Data, how easy will it be to shuffle/transfer that much data around? – The more provider APIs and Services that you depend on the harder it is to move. Why? Because there are only two paths that can be taken in a move. The first is to find another provider that has the exact same set of APIs and Services (this will limit your choices). The second is to change or rewrite your application to take advantage of the new Cloud provider’s APIs and/or Services. – Different providers have different charges for the consumption of the same resources. Your current provider gives free usage of queues for applications. The provider you are looking to go to charges after the first X number of messages on the queue. Now what do you do? You will either pay more when you move, rewrite your application to fit the new provider’s model, or pick another provider that has free queue usage. – Different QoS guarantees from Cloud provider to Cloud provider. Some Cloud providers offer SLAs with reimbursements for outages, others only offer best effort. Some providers offer tiered Services, others only offer a single tier. What happens if you want to move and you can’t get the minimum level of QoS that you need? This is NOT an attempt to dissuade anyone from using Public Clouds (they are incredibly valuable and powerful), but I would like more people to go in eyes wide open. Today Salesforce.com announced Database.com at Dreamforce. I realized that many could be wondering why they decided to do this and more so, why now? The answer is Data Gravity. Consider Data as if it were a Planet or other object with sufficient mass. As Data accumulates (builds mass) there is a greater likelihood that additional Services and Applications will be attracted to this data. This is the same effect Gravity has on objects around a planet. As the mass or density increases, so does the strength of gravitational pull. As things get closer to the mass, they accelerate toward the mass at an increasingly faster velocity. Relating this analogy to Data is what is pictured below. Services and Applications can have their own Gravity, but Data is the most massive and dense, therefore it has the most gravity. Data if large enough can be virtually impossible to move. 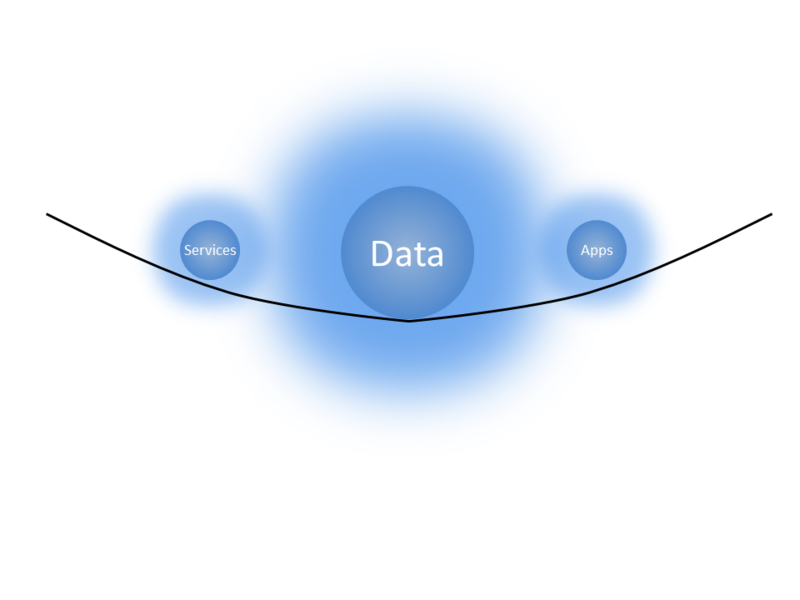 What accelerates Services and Applications to each other and to Data (the Gravity)? Latency and Throughput, which act as the accelerators in continuing a stronger and stronger reliance or pull on each other. This is the very reason that VMforce is so important to Salesforce’s long term strategy. The diagram below shows the accelerant effect of Latency and Throughput, the assumption is that the closer you are (i.e. in the same facility) the higher the Throughput and lower the Latency to the Data and the more reliant those Applications and Services will become on Low Latency and High Throughput. How does this all relate back to Database.com? If Salesforce.com can build a new Data Mass that is general purpose, but still close in locality to its other Data Masses and App/Service Properties, it will be able to grow its business and customer base that much more quickly. It also enables VMforce to store data outside of the construct of ForceDB (Salesforce’s core database) enabling knew Adjacent Services with persistence. The analogy holds with the comparison of your weight being different on one planet vs. another planet to that of services and applications (compute) having different weights depending on Data Gravity and what Data Mass(es) they are associated with. Here is a 3D video depicting what I diagrammed at the beginning of the post in 2D. After some time away from the Public Cloud Compute Comparison that I did a couple of months ago (which got X hits), I decided to update it based on feedback and new ideas. What follows is a brief walkthrough with instructions on how to use the Calculator. Before I go any further, a brief disclaimer: I do not warrant the accuracy of this Comparison and Calculator, it may have errors and omissions (all unintentional if they exist). I also take no responsibility if your bill turns out to be something very different than what the Calculator shows. And finally, I’m employed by Dell, which has relationships with Microsoft, Joyent, and Amazon, and possibly the others and I’m just not aware. I’ve updated the Compute with Terremark as an additional provider, I would be interested in adding others if people are interested simply add a request by commenting at the bottom of this post. Also added, is the ability to Calculate/Estimate your costs by using the add Quantities fields. To use the Quantities, add the number of each type of Compute instance as you like and get a rough idea of what the cost will be. Please note that there are assumptions, however for the most part I have annotated in the spreadsheet what those assumptions are. Once you are happy with your compute instances, you can go down to the bottom and move to the new Cloud Storage Comparison and Calculator. By entering some estimates across the top and choosing a quantity (this would usually be 1, which acts as a trigger to calculate Monthly Cost) you can easily get an idea of what your storage cost would be. And finally we have the Cost Summary Page. This page combines the Total Monthly Cost from the Compute and Storage sheets into one place. In the next post I will cover different results that came out as I used the Calculator.